Tinsel pictures became popular during the 1830's primarily in Pennsylvania and New England and continued to be made by folk painters throughout the century. Imitative of Chinese works imported in the 18th century, these pictures are reverse painted on glass, the back side of the glass painted with translucent colors and further embellished with crinkled foil. This adds a shimmering effect to the painted image which usually hung in an environment lit by candles or gaslight. While Samplers were created primarily by schoolgirls as part of their education, after the mid 19th century tinsel pictures were created almost exclusively by women. Because of their colorful nature they were able to hold their own in the midst of all the Victorian bric-a-brac. 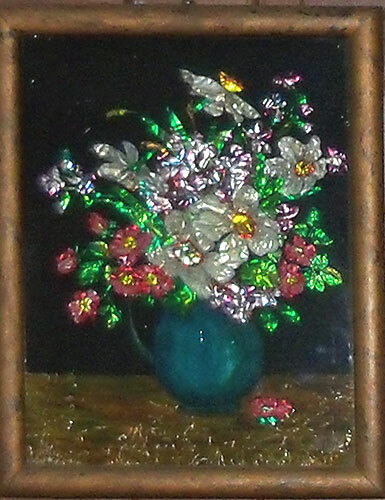 This is an extremely fine tinsel, or foil, painting, showing a blue vase overflowing with a wide variety of flowers, with a fallen flower at the base of the vase. It is housed in a period frame, probably original to the piece measuring 12-1/2 inches by 15-1/2 inches. The condition is excellent.